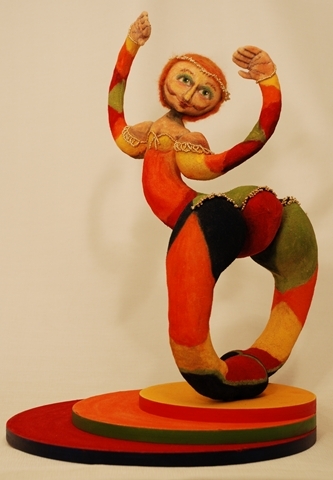 This doll is painted with chalk pastels. Its form and position were designed to exhibit interesting positive and negative shapes. 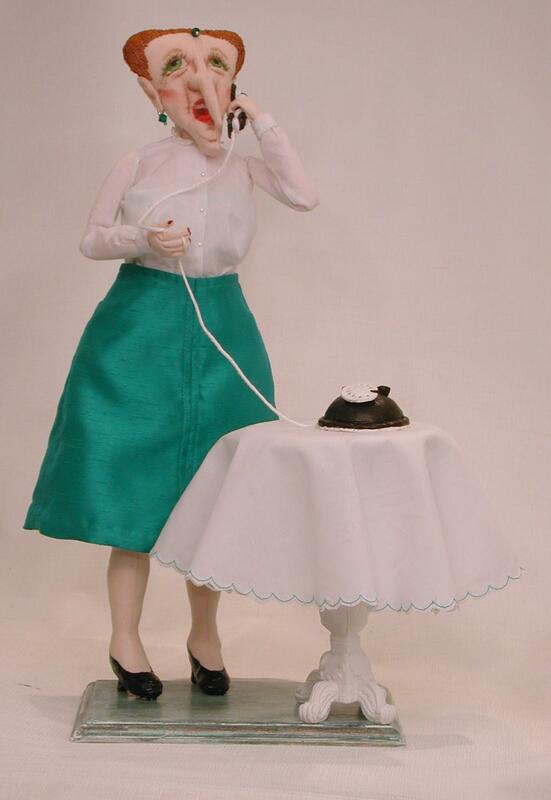 Louie is an original cloth doll. His face is painted with soft chalk pastels. Anna is in her first ballet recital. She's a little nervous but so pleased to perform in front of her parents and friends. 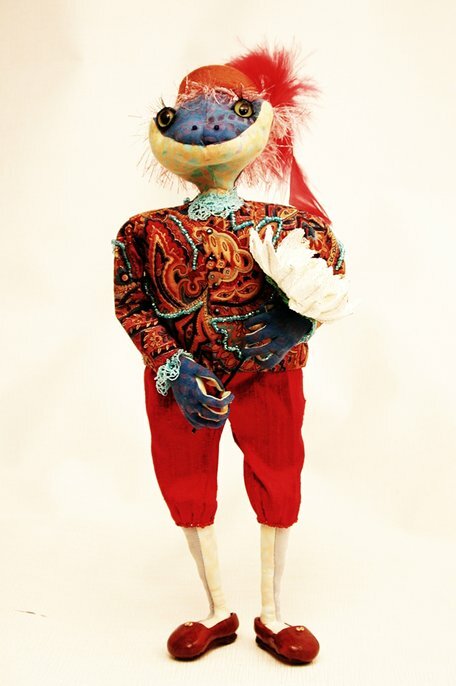 She is a felted doll with machine embroidery and machine beading. 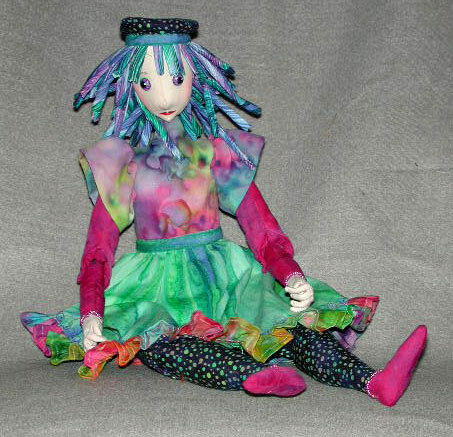 Anna won third place in the Felted Doll division of the CDAA 's Celebration 2007 competition. Stx is a tree fairy. He is surprised that you have seen him. Usually he is invisible among the leaves and branches of the trees in which he lives. Stx won third place in the Photography division of the CDAA 's Celebration 2006 competition. All dressed up and ready to go out. Imagine him showing up at your front door for a date. This fairy spends most of her time playing among the upper branches of th eoak tree behind my house. she changes colour with the seasons so that she will blend in and not be noticed by mere mortals. Ol' Man winter is getting old. winter is almost over and he's worked very hard to bring many storms and blizzards. He is just about to blow his last storm of the season. Witch with Red Shoes and Mouse. She saw the shoes in a store window and just had to have them. Maeve is a garden spirit. 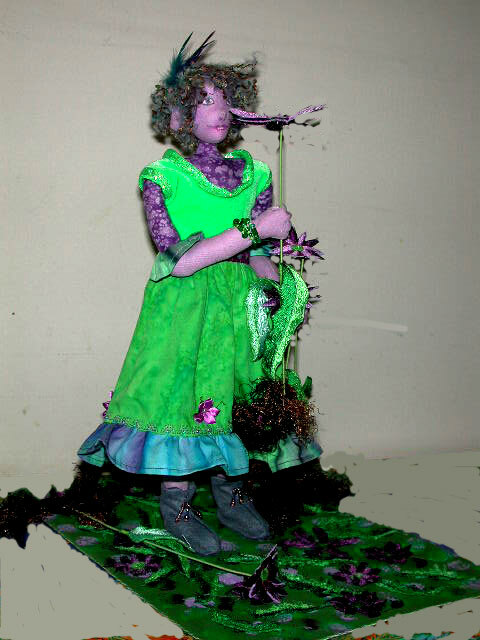 She was dancing among the flowers and got carried away destroying much of the garden. 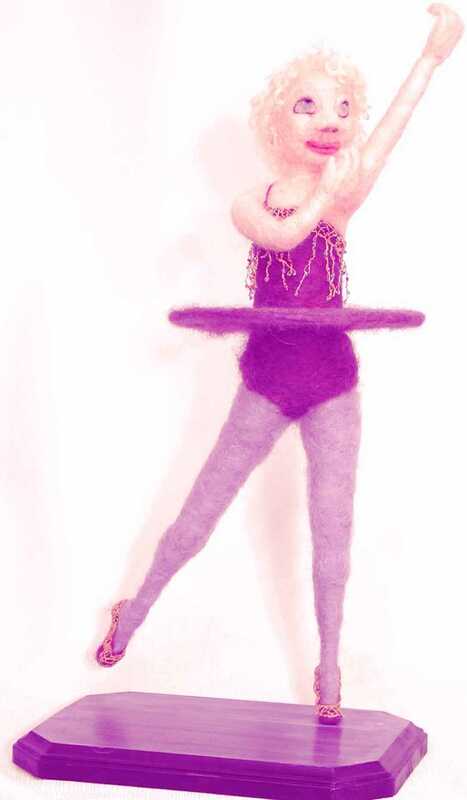 Twirling Shirl loves to twirl. She practices skating - especially her twirls - every chance she gets. She is confident that she will win a medal at the next Olympic games. Bright colours and wild dancing are the Sun Dancer's strategies to entice the sun out from behind the clouds. 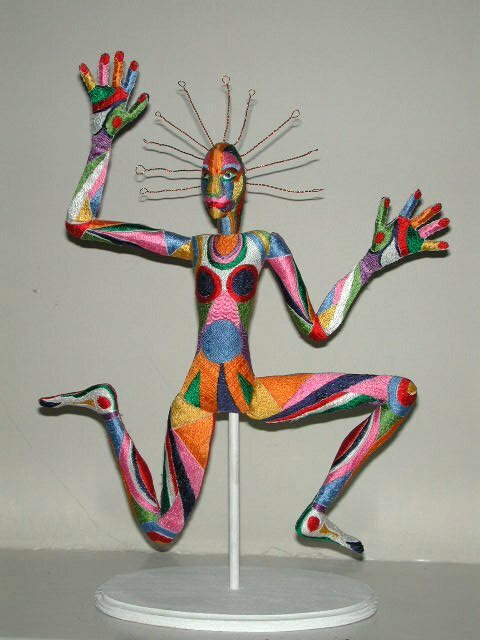 Sun Dancer is an embroidered doll designed to hang on a wall. It was machine embroidered from an original design I created using Husqvarna Viking’s Professional Plus Embroidery System software. The headdress is copper wire. 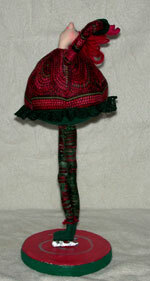 The back of the doll is multi-coloured using cotton and poly-cotton fabrics. 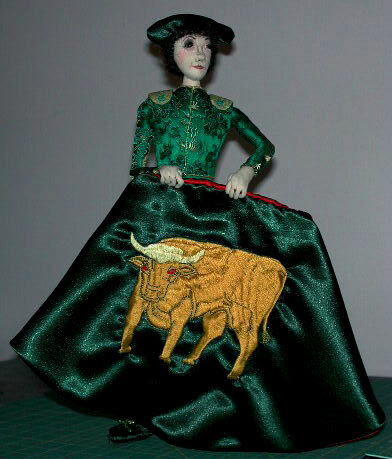 The embroidered hands are appliquéd on by hand using invisible thread. 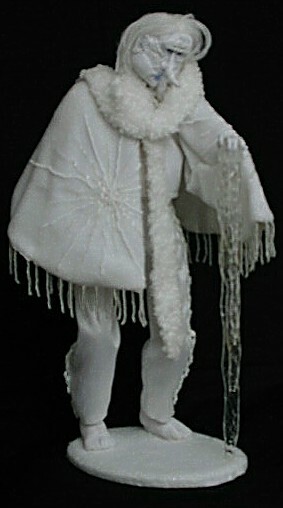 Sun Dancer won Honorable Mention in the Professional Doll Category of the "Everyone Loves Sulky" Challenge 2003. Anthea is a butterfly fairy. 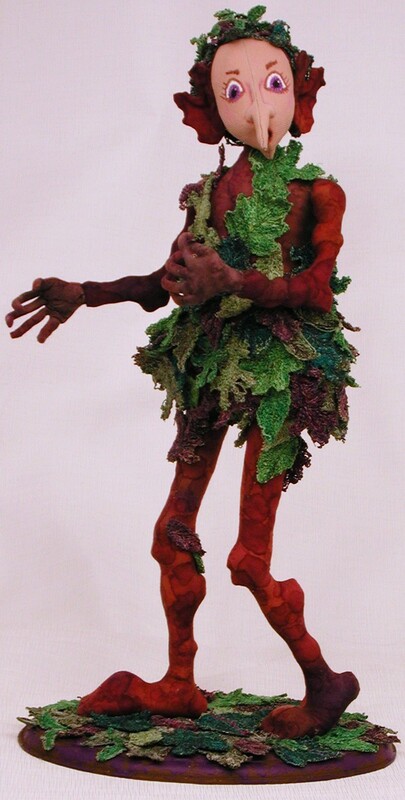 Her mother was a garden sprite and her father was a butterfly. 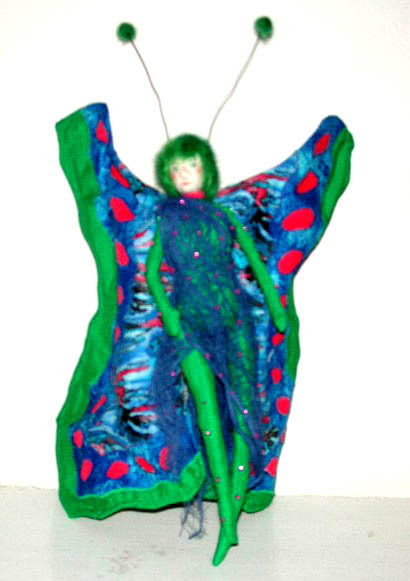 Her hair is felted and her wings are appliqued. Her dress is dyed, distressed cheese cloth.